"FAT-TEN-U FOODS increased my weight 39 pounds, gave me new womanly vigor and developed me finely. My two sisters also use FAT-TEN-U and because of our newly found vigor we have taken up Grecian dancing and have roles in all local productions." I'm dying to know what was in this stuff, but I can't find the ingredients anywhere. Social norms have clearly changed since the late 1800s. Today, leanness is typically considered more attractive than plumpness. 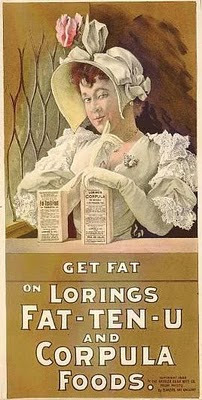 Women had to make an effort to become overweight in the late 1800s. In 2011, roughly two-thirds of US women are considered overweight or obese, despite the fact that most of them would rather be lean. A rhetorical question: did everyone count calories in the 1800s, or did their diet and lifestyle naturally promote leanness? The existence of Fat-ten-u is consistent with the idea that our bodies naturally "defended" a lean body composition more effectively in the late 1800s, when our diets were less industrialized. This is supported by the only reliable data on obesity prevalence in the 1890s I'm aware of: body height and weight measurements from over 35,000 Union civil war veterans aged 40-69 years old (1). In that group of Caucasian men, obesity was about 10% of what it is today in the same age group. Whether or not you believe that this sample was representative of the population at large, I can't imagine any demographic in the modern US with an obesity prevalence of 3 percent (certainly not 60 year old war veterans). "Women had to make an effort to become overweight in the late 1800s"
I'm not sure you can make this comment about women back then generally. Isn't it possible that this was a niche product for the over-skinny (which I'm sure there were more of back then, but was it the norm?) I've seen plenty of pics of "plump" but not extremely fat women from that time period (maybe they were all on the product). An original ad is on file with Library of Congress. Wonder if they have an original package, which might list the ingredients? "A combination of artificially digested fat producing elements from the choicest cereals, combined with other carbohydrates, proteids and phosphates, possessing not only the highest possible qualities as a food, but capable of aiding digestion of cereals and other foods so as to render them less liable to cause indigestion." i'll see if i can make out the text on the other one. I think we can (generally) infer that the female form was leaner in times gone by. Take, for example, the classic use of Marilyn Monroe as a defense of a "size 12" form. A "size 12" is much (much) larger today than it was in the 1940s. Monroe would wear a loose size 0 today. The charts were not predicated on a single woman's size. That "size 12" women have gone from a 22/23 inch waist to a 30 inch waist is indicative of a good bit of population change over the large 60 or so years. I found a hi-res version of the first ad. Here's what I can make out by zooming in on the package copy in Photoshop. are the result of years spent in making experiments with various compounds to produce a flesh producing agent. They will produce from 8 to 16 lbs of solid healthy flesh per month. The tablet is to be taken three times a day before meals. The dose for an adult is one tablet. For children, half the dose. What the tablets contain: These tablets contain hypophosphites of Calcium, Sodium, Iron and Manganese combined with Pepsin and Nux Voinica (sp? ), and act as a tonic, digestive and nerve nutrient favoring assimilation of food, increasing tone of digestive organs and thus building up the entire system. Directions for using: Three times a day before meals. One to four teaspoonfuls in a glass of milk. If milk is objectionable, use cold water. If subject to distress after meals, take the food in warm water (not hot water, as it impairs the value of the food). What Corpula contains: A combination of artificially digested fat producing elements from the choicest cereals combined with other carbohydrates, proteins, and phosphates, possessing not only the highest possible qualities as a food, but capable of aiding digestion of cereals and other foods so as to render them less liable to cause indigestion. Wate-On in the 1980's-are we to assume from this ad that women in the 1980's were too skinny as well, and generally had to try hard to put on weight. This is a total niche product, and, although I realize women were generally thinner in the 1800's (I agree with Stephen's overall argument, I just don't think Fat-ten-u is evidence of it), I know for a fact most women were not trying to put on weight in the 1980s. One thing hasn't changed ... it's women who really get pressured to conform to societal expectations of weight. I'm sorry but Marilyn Monroe would NOT be a loose size 0 today. That is ridiculous. She might not be a size 12, but a size 0 is very very skinny. I also don't believe a size 12 was ever a 22 inch waist. What was a size 6 then, a skeleton? I have seen plenty of pictures of plumpish women from this time period. Not obese, just plump. In fact the "before" woman in the Fat-Ten-U ad is plump, by today's standards. Surely that was a typo and Monroe would wear a loose size 10 today (not 0). In any case, anyone who enjoys buying and wearing vintage clothes, or has any left around from their own parents or grandparents, will easily be able to attest to the fact that people even just a couple of generations back were much slimmer than we are. I've often wondered what was so different about their lifestyles to make this so. My own grandparents (WWII generation) were very slim in their youth -- none of us grandkids could possibly squeeze into the clothes they wore at our age (this is true despite the fact that I'm roughly the same height as my grandmother and wear modern size 6 or 8). I know for a fact that they ate plenty of bread and sugary desserts, too, although I believe portion sizes for everything were much smaller. I think you're right, Thomas. Women naturally come in different shapes and sizes, but "one" is often chosen as the ideal for the times. There was some doofy article recently lamenting the lack of hourglass women like Liz Taylor. Uh...there are plenty, they're just not so much in fashion. The real reason why so many women were too thin in the 19th century had nothing to do with healthier eating or more active lifestyles. Tuberculosis was endemic in all social classes and people with TB get rail thin. Thin women with TB were likely to die during pregnancy, which would make large women more attractive as life-partners too. You see the same phenomenon in India. Fat -- or plump - is considered a bit more attractive. As TV and modern advertising has come in that is changing, but certainly in second tier cities and towns it is still true. And plenty of overly-thin women who need a few extra pounds. The obesity rates for civil war veterans is interesting, but it would be interesting to see the overweight percentages as well. In that context, a 3% figure for men between 40 and 60 isn't that surprising. Vintage size 12 is roughly a modern 8. Waist sizes may have been smaller but were often helped out by some serious undergarments... 12 was NEVER a 22 inch waist. You can still buy weight gain products at your local GNC. A certain fraction of the population to this day cannot get truly fat. @Jenny-TB, that is very interesting. I never would have thought of that, at least off the top of my head. I know in some cultures a more plump look is a sign of good health due to just having enough food to eat. I think Americans eat more in general now (vs. 100 years ago), and likely a lot more calories that have comparatively less nutrition. Eating on the go has a lot to do with this IMO. Fat-ten-u and Corpula. I love it. Thank you for making me laugh. I think Jenny is on the right track. More generally, I think it's related to social class. Back in the days of widespread manual labor and caloric shortages, the rich could afford to be fat. Now it's the upper classes who can afford to be thin. Just look around at the mall and grocery store if you question this. Weight is just one of several visual indicators of social status. In poorer U.S. communities today, heavy children are still often seen as healthier. There is still anxiety about getting "enough," even though the overarching challenge is getting enough of the right kinds of food and less of the wrong kinds. Though it's going out of fashion among the upper classes now, suntanning (in white people) follows the same social trend. When common folk did a lot of outdoor labor, suntans were considered unattractive. When most work moved indoors, suntans became a sign of outdoor leisure time, and became attractive. EvenRose is correct. 25 years ago I wore a size 10. I'm the same size now, and I wear a 6. In the mid 70s my BMI would have been roughly 17.3 (if anyone had heard of BMI) I wore a size 5 dress to prom. Marilyn Monroe was not underweight, no way would she fit in today's size 0. I believe it was inherently more difficult for women hundreds and thousands of years ago to gain weight due to the simple fact that modern junk foods were not available to screw up the body's weight regulation mechanism. I wrote a post on Tribal Fattening Practices> a while back, and I was astounded by how much food women of Mauritania, Africa had to eat to put on, and keep on, weight -- 16,000 calories! Your point is well taken. Keep in mid though, that obesity was considerably less prevalent in the early 80s than it is today. Good point. Still, I think it's safe to say that people were leaner then, on average. I'd like to see references for those numbers, but regardless, they're still 3X higher than 60-69 year old Civil war vets in 1890. Do those numbers refer to adults only, and what is the age range? Since obesity increases with age in the US (until old age), an obesity prevalence of 2.9% in the 60-69 year old age group in 1890 is extraordinary and I doubt you'd be able to find any US demographic that approaches it. Cigarette smoking didn't become prevalent until the 1920s, so that wasn't a factor here. I doubt pipe smoking has much impact on weight but I'm willing to be corrected on that. Typical diet for the American lower middle-class in the 19th century was based around wheat flour, sugar, salt, beans and bacon. Hardly a pre-industrial diet and actually quite similar to the modern junk food diet, other than the beans. If we assume the bacon came from pigs fed corn, you even have the same imbalance of omega-6 to omega-3 fatty acids as from junk foods made with soybean oil rather than lard. The reason people didn't gain weight on the diet above is partly that slow-but-steady physical labor depress the appetite while raising energy expenditire, and partly that the food wasn't in a ready-to-eat form, so you couldn't snack while working but rather had to wait until mealtimes to eat. The truly poor in America (blacks and poor whites in the south) couldn't afford the bacon and replaced the wheat flour with corn, resulting in extreme leanness and even pellagra due to lack of niacin. Beef tended to be lean compared to pork, because the cattle were grass-fed and hence lean to start with, plus they lost what fat they had on the long trip to the slaughterhouse. Thus heavy beef-eaters in the old days, especially those who engaged in physical labor (such as working cowboys) tended to be thin. Those with money could add butter and eggs to the diet above, hence the expression "butter and egg man", though I doubt this made gaining weight any easier than with lard. The real reason those who could afford butter and eggs were fat is they didn't have to engage in so much physical labor. Combat soldiers used to have a big problem with weight loss, despite rations of 4500 kcal/day for a typical fit American male, 5'8" tall weighing 140 pounds. The problem was palatability of the rations. This is less of a problem nowadays, since the junk food manufacturers have become quite expert at producing food with long shelf-life, no preparation required, but also is wonderfully palatable. Think premium brand soft-baked cookies. Honestly, I just can't seem to get more than a "oh, that's neat" out of me. I think that we're a lost generation, as far as body fat is concerned. I think the sanest thing we can do is just eat real food and be active (if we feel like it). We need to stop warring against ourselves and just accept ourselves as we are. Not for warm fuzzy reasons, but because that's just the reality of the hand we've been dealt. Our children will have to be the svelte ones. Maybe not even them. Maybe their children. Sooner or later, things will sort themselves out. We as a society need to be patient above all other things. OK, I got a few numbers wrong. The civil war veterans were 60-69. And the NYC figures are between 8 and 15% percent. If I read your linked abstract right, they found that BMI didn't increase with age -- it shrunk back then. But again, looking at the DC figures, a 9% for all white adults vs. 3% for 60-69 white men isn't shocking to me. We forget how much obesity is just a class issues. I wear a size 0 or 2, I am not over or underweight, and have a 26" waist. I don't know what Marylin Monroe's measurements are, but I wouldn't be surprised if they were similar to mine. Butter and Eggs will not make one fat anyway, as much as copius carbs and sugars and a leisurely lifestyle. Even if the diet was woven around bread, bacon and beans, that is not a recipe for obesity the way it is today - with our over-processed, nutritionally deficient, tainted food. There is plenty of evidence out there that there is a massive difference between homemade bread from freshly ground flour, and a loaf of airy, toxin laden bread from the store. Combine that with our toxin overload, hormone disruptors, and poor gut flora, and we have obesity as we see it today. Thanks for the post - it is very entertaining! Jen's comment sums it up well. Monroe was reported to have a 22 to 24 inch waist (and 35 to 37 inch hips so corseting was probably involved). It's also interesting to note that someone with a 25 inch waist in the 70s wore a size 8, yet now wears a size 0 - a 4 size reduction in 40 years. Run through a resale shop and you'll see that sizes are off by 1 increment between now and the mid-90s (ie, a 10 then is an 8 now). Of course, women also took corseting very seriously, so the smaller sizes are owed in part to that. However, the hips cannot be corseted. =) This site has some interesting information on the changing sizes, such as a 1950s size 10 equating to a US 4 now. I recall as a child ~1965, my mother explaining to me that chubby used to be considered healthy. We were reading an old nursery rhyme book that showed chubby, rosy children getting gold stars by a school nurse for their efforts. I was only about 4 or 5 but thought the notion was crazy, guess I had already been indoctrinated into the fear of cholesterol and sat fat? The book was from the 40s, or maybe the 50s. Fair enough. DC Caucasians have a low obesity prevalence, but keep in mind it's an extreme outlier. Socioeconomic factors play a role as you mentioned, as well as age (DC Caucasians are probably younger than the population at large-- people don't retire to DC). Also, the smaller the sample size and the larger the sample number, the more likely you'll be to find statistical anomalies. The prevalence of obesity in my lab is 0 out of 12. The fact that Civil war veterans lost BMI with age is precisely the point. It's the same thing you see in non-industrial cultures and it reflects a loss of lean mass and approximate maintenance of fat mass with age. Contrast that with modern populations, where lean mass declines and fat mass increases to compensate and then some. In the year 2000, obesity prevalence was 41.3% in 60-69 year old Caucasian males. Without gainsaying anything else that has been said, I think Helen put her finger on a crucial aspect--simple social norms. Helen pointed to social class, and there is the larger issue of fashion generally. In the 1920s, flat-chested and -hipped was good. Girls wanted desperately to look like boys. In the 1950s of my youth, the hourglass figure someone mentioned was good. At various times and places -- Hawaiian royalty, the African tribe someone mentioned -- extremes have been admired, and attained. What people want badly enough, many often manage to get...even if ambient conditions sometimes mean that it's mainly the really well off who are successful. I believe the reason 19th century women wanted to be heavier is so they could work harder and possibly be more resistant to the illnesses of the time. The number 1 medicine of the 19th century was laudanum (opium) which was widely used even for infants and sold cheaply without a prescription. Commonest ailments were a generalized feeling of fatigue and intestinal distress. Look at Rockwell’s painting, Freedom From Want, http://en.wikipedia.org/wiki/Freedom_from_Want_(painting) to see how even early twentieth century working class women were portrayed ideally as heavy. Saying marilyn would be a loose size zero is absolutely ridiculous. Right now I am about a tight zero or a well fitting 1, my waist is 23.5 and my hips are about 34.25 (depending on bloating and such things). I am 5'5. When I look at pics of marilyn monroe it is rather obvious she is much curvier and heavier than I am. Most people tell me I am sickly looking due to being thin. I'm the sort of thin where some people like it but others think it's gross. I tend to think I'm normal size but a lot of people tell me I am really ridiculousy thin, even people who seem very thin to me tell me this, so I tend to believe other people. I would guestimate marilyn monroe is a size 4. Thin people still exist today. A size 0 today is still rather small, anything 6 or below is "normal" sized. It's 8, 10, 12 which are kinda chunky. Keep in mind height affects size. Some (many) girls are a size zero, but they are only like 5'1 so in reality they aren't that skinny, they are just really tiny over all. One thing you need to keep in mind is that the age these girls are fed and abnormally made obesity is the height of youth - 5 years old, teenagers. Even in america, most young girls are not obese. Obesity doesn't start to affect people until their mid 20s or so, when they get a bit older. I seriously doubt they would have to try so hard to fatten the = older women in their villiage. After your 20s, when you've had a few kids, suddenly gaining body fat becomes pretty easy. I don't think it's any more valid to attribute obesity to "lack of whole foods" than it is to blame it 100% on carbohydrates. Where is the proof? It sounds nice to say it's because we're not eating whole foods therefore we are fat, but there are plenty of fat people out there who eat only whole foods and still are quite obese. Obesity is clearly polygenetic and multifactoral... but either way, it's evident that hyperinsulinemia mediated from carbohydrate is important, so those who are ALREADY FAT or at risk for it benefit from a low carbohydrate, lower calorie diet. It's not so important to know all the reasons why this hyperinsulinemia happens, it is only important to control it. My tolerance for carbohydrate has improved quite tremendously since adding supplements to the diet like acetyl-l-carnitine, inositol. However I'm pretty sure things would not go well if I tried to eat crushed dates and honey and nuts and milk even to "satiety". I'm pretty sure I would start packing on fat quickly as a direct result of excessive insulin release leading to hunger and hypoglycemia and a change in metabolism. "The typical Nux Vomica patient is rather thin, spare, quick, active, nervous, and irritable." Just to follow up on a line of thought. If a person engages in physical labor and eats a low-fat/high-carb diet, whether whole grain or refined grain doesn't matter, they will lose weight and lose it fast, like several pounds a week for a typical male. Does that mean physical labor (or enough exercise to equate to physical labor) plus a low-fat/high-carb diet is the solution to obesity? No, because anyone engaging in physical labor will have a ferocious urge to eat fat, and it will be impossible for most people to resist this urge. This is partly where the conventional wisdom that "fat makes you fat" comes from. People MUST eat large amounts of fat to avoid losing weight when engaging in physical labor or strenuous exercise, so simply removing the fat causes immediate and rapid weight loss (mostly of body fat, not of lean muscle). It is in the absence of physical labor or strenuous exercise that low-carb/high-fat becomes a better weight-loss solution. Of course, physical labor and strenuous exercise also require willpower, as does refraining from eating carbs. It always comes back to willpower in the end. @ Revelo It always comes back to willpower in the end. Because of my underlying condition (PPS) I don't have the option of physical labour/strenuous exercise. Yet I eat all my appetite requires and too regularly open a bottle of red. Counting Calories/Carbs plays no part in my weight maintenance program. I eat only foods that don't increase appetite. I include bifidogenic fructooligosaccharides to improve lean type anti-inflammatory gut flora these absorb fewer calories and improve omega 3 status. I've improved natural melatonin secretion and supplement with it to protect mitochondria. Dysfuntional mitochondria reduce ability of BAT to maintain body temperature by burning calories at night following a drop in room temperature. Whether everyone can restore the normal regulating controls for appetite and activity is debatable, perhaps it was fortunate I'd improved vitamin D, omega 3, magnesium status before adopting a low carb lifestyle. I don't have sufficient will power not to empty a bottle of wine once it's opened nor to refrain from opening another one if I feel the need. If I'm hungry I simply don't have the will power not to eat in the same way if I hold my breath I don't have the willpower not take another breath. 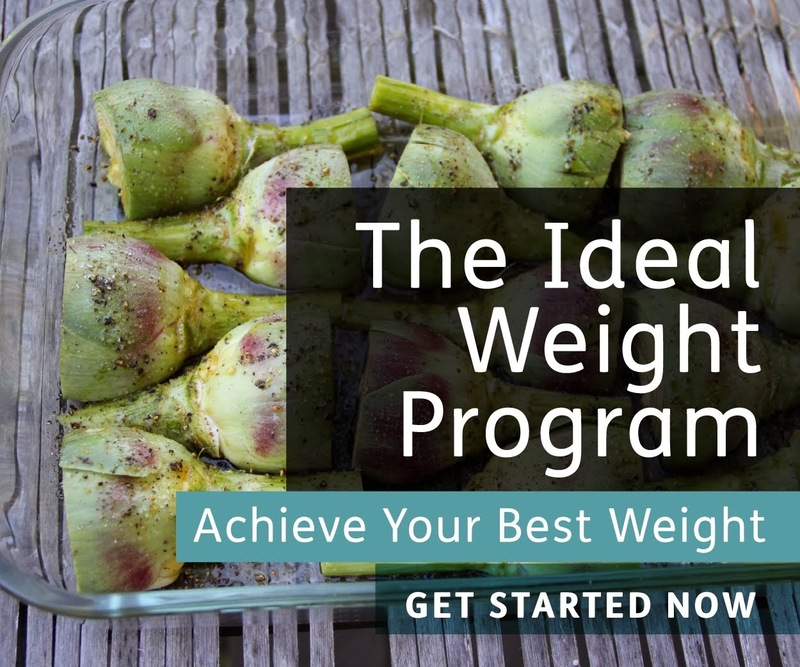 I think when you understand the processes that enable your body to access stored fat it is relatively easy to reduce appetite and calorie intake without willpower or knowingly restricting the amount you eat or even knowingly increasing the amount of activity you perform. I think it is as misleading to say willpower is required for weight loss/maintenance as to say exercise or calorie restriction are fundamental requirements for weight loss. 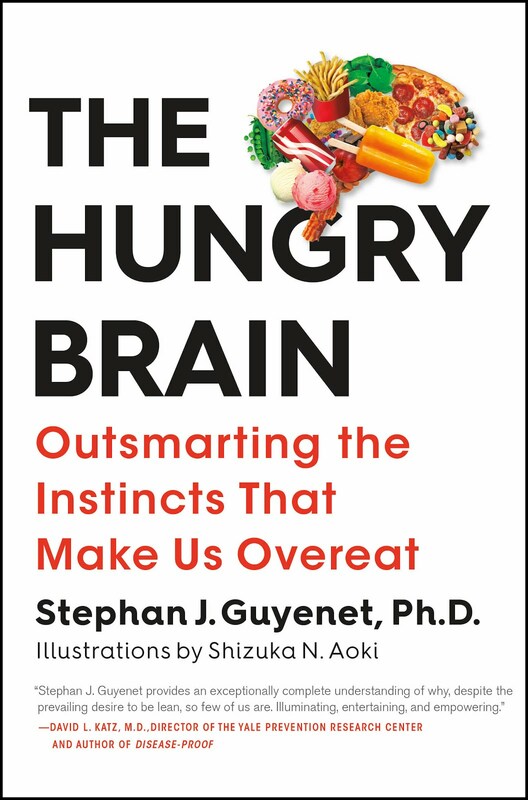 Our brains have a mechanism for controlling impulsive behaviour instinctively without the input of willpower. If you are omega 3 deficient the natural controls that regulate impulsivity will be reduced so you will have a larger appetite and less ability to control it instinctively. I think it's probable daily Coconut oil & green tea consumption also assist my appetite reduction and activity level. 1. It was a random dialed telephone survey. That means it includes cell-phones, and so it includes a lot of people who live around Washington D.C who have a 202 mobile. 2. Self-reported data, which means DC whites may be a bit more self-conscious than others. 3. Seems as if they tried to balance the telephone replies with census data on aging, so depending on how they did that the DC sample may not be age-skewed. Again, Obesity is largely a class and race problem. How many white people with incomes over $100K are obese? 250K? I'm more interested in "overweight" because that is where all Americans are failing. Basically anything over a 20 BMI is a marker for future heart diseases. As a seller of vintage sewing patterns (and vintage clothing), I think I can be of assistance with clothing sizes! I have some older patterns going back to the late 19th century, and will have to dig them out. If you have ever seen an actual Civil War soldier's uniform in a museum, you would be totally shocked at how tiny it is! They look like they would fit a young slim boy of today. "Observing the fact that the annual per capita consumption of sugar in the United States had tripled over the preceding decades from 38 pounds to 115 pounds, "
USDA thinks sugar consumption in 1970 was 119 pounds, and is now 142. "I eat only foods that don't increase appetite" - that requires willpower. I don't eat pasta and bread anymore (gluten avoidance), nor do eat/drink sugary foods (fructose avoidance). That most definitely requires willpower because it would be disingenuous to suggest that I still don't "want" to devour a bowl of pasta with bread (of course with some red wine!) or eat mountains of ice cream. Have my tastes for some "bad" foods diminished...yes, but completely gone away, no. I do not think I am unique in this regards. My 2 cents is that people have confused the original Taubesian views on calories-in/calories-out vis-a-vis gluttony/sloth. I am 100% in alignment with Taubes on this and hormones being the key. But does it not require willpower to avoid neolithic agents of disease that are so easily accessible and pervasive in the world we live in? Good points. But keep in mind that BMI is a very crude measure. What really matters is body fat percentage. If your BMI is 23 but you're lean and muscular, that's not going to increase your disease risk. Thanks for the info. According to data collected at the time, civil war soldiers were both leaner and shorter than we are today. They were about as tall as Kitavans. Another point. A modestly overweight BMI (~25) is associated with a lower all-cause mortality than a non-overweight (or obese) BMI. Hmm, looking at the data again, it does look like there was a plateau in sugar consumption from ~1920 to ~1970. Interesting, I hadn't picked up on that. I wonder if a BMI of 25 today correlates with lower mortality because it's so easy to be slightly overweight in this environment - maybe some of those who are thin within the current context have a disease process going on or are the frail elderly. I'm now down to a BMI of about 20. I had peaked at 25. About ten pounds of the loss was related to upper GI pain - so I'm an example of sorts. Other examples: A friend of mine went from thin to very thin when he got Crohn's disease. My father-in-law lost a lot of weight due to undiagnosed diabetes. My father got downright gaunt in the year before he died at 82 of congestive heart failure. At my new weight, people, including me, are somewhat shocked at my thin appearance, but I'm not yet officially underweight, underscoring Charlie's point. The goal posts have changed. I agree. I think the data are probably skewed by people who are thin because they're sick. Also "skinny-fat" people who have a pot belly but not much muscle. Charlie - I tend to think that obesity is a complex neuroendocrine disorder. One of the signs and symptoms of obesity is apathy and fatigue, mental and physical. The reason very few wealthy people are obese, is because the wealthy and high class are self selecting for ambition and energy. People with incomes greater than 100k per year are a small minority of the population. Saying that obesity is a class/race problem because it is not seen in the very small self selecting population of highly ambitious highly energetic highly motivated upper class wealthy people is circular logic. It's almost like saying schizophrenia is a disease of the FBI monitoring your thoughts, because schizophrenia is only found in people who feel as if their thoughts are being broadcast or monitored. Actually, a core symptom of schizophrenia is abnormality in conceptualizing ones thoughts (that people are listening to them, monitoring them, stealing them, inserting them)... so stating this as the cause of schizophrenia is incorrect. All in all you are saying nothing about the etiology of schiozphrenia and are merely restating a core symptom (as if it explained anything). Similar to obesity, a neuroendocrine systemic disorder, apathy and lethargy are key symptoms, so it is obviously going to be vastly overrepresented in the lower and middle classes, as people in the upper classes with high incomes are self selecting for energy and motivation. How can you run a business, be a high powered attorney, or complete medical school and residency if you can't stay awake after 6 pm because your blood glucose is >140? How can you care enough to be a boss, if your dopamine receptors have down regulated themselves to nothingness because of hyperglycemia? When you are in the metabolic state of obesity (HINT: obesity is fundamentally related to the hibernation response), you have zero energy and motivation. You can barely stay awake and go to work. You sorta just want to sleep and watch TV for good reason. The fact that obese people are "lazy" and generally do not move much is taken as evidence that forcing fat people to exercise will cure obesity. False. If you want to fix the psychomotor retardation and immobility of obese individuals, you need to stop the hyperinsulinemia and hyperglycemia going on inside of their bodies. When this is accomplished, central dopamine receptors upregulate themselves, the sympathetic nervous system is more active, there is greater catecholamine activity in response to lower blood sugar (as a drop in blood sugar stimulates the SNS to make catecholamines which result in a feeling of energy and alertness), there is a change in the hypocretin system in your brain (blood glucose suppresses hypocretin which acts like a light switch in your brain, sleepy time, just like a narcoleptic, night night!) and viola suddenly your fat pile of goo starts moving around and sleeping normally. Regarding this "magic" number of a 20 BMI - again, this is circular logic. People who are thinner than a BMI of 20 are extremely thin. Extremely thin people do NOT have hyperinsulinemia, DM spectrum glucose problems, with heart disease as a final stop. That is very, very, very, VERY rare for a thin person, TRULY thin (BMI <20) to get that disease. When it occurs, it almost always means the person has a genetic disorder which prevents them from storing body fat in response to insulin. Which, as stated, is very frigging rare. With the exception of very rare people, almost everyone who is less than a BMI of 20 is basically totally clear of metabolic disease. Being clear of metabolic disease will also mean you won't get the final stop result : heart disease. This has been discovered many years ago. The only difference between people who become very obese and people who do not, is generally that the genetic code of fat people is such that their adipocytes are really good at listening to insulin and making body fat. The capacity for your fat cells to grow fatter or to multiply in response to insulin is ENTIRELY genetic, and those from "fat families", with a history of obesity in the family, generally have the genetic tendency to become fat as hell in response to elevations in insulin. People with BMIs greater than 20 may or may not have metabolic disease... but almost *no one* with a BMI less than 20 has metabolic disease. Again, this is fundamental: INSULIN controls fatness. Diabetic dogs who emaciate without insulin and grow fat with injections of the hormone, and every single case of type 1 diabetes for that matter, proves that insulin is the gateway which controls body fat (however, there is a great deal of genetic variation in how fat one can become in response to insulin - THAT is the key to obesity as a disorder). Saying being thinner than a BMI of 20 to prevent heart disease is like saying "people who are presently effective neurosurgeons are very unlikely to develop severe alzheimers disease in the next 6 months". I mean, duh. Obviously. Way to state nothing. The question is, do normal people need to be less than a BMI of 20 to avoid heart disease? No. All you need to do is know your glucose and insulin levels, whatever your body fat is doesn't matter because this is highly individual. Stephan; my reading of the death rates and the BMI chart is today, many of the people with lower BMIs are regular smokers -- and thus dying of lung cancer. In terms of sugar, the depression and WW2 rationing might have "hidden" a gradual increase in sugar during this century. However, much like chicken, there may have been a difference in the way it was being delivered from 1930-1970. Clearly, Soda today is the major delivery device. If you look at the links I provided, the data from NYC backs up your point on exercise. I don't see much difference in the obese vs. non obese in terms of walking 10 blocks. However, your point on a BMI of 20 is a bit off. My take is a BMI of 20 would be considered highly abnormal in American society today. However, if you travel to any third world county you will see billions of people with that body composition. So why it may be rare in American life today, for much of history a BMI of 20 may have been considered "average." Sounds like classic snake oil to me. Back then there were no regulations to prohibit "creative" marketing! Stephan, this is a bit out of topic, but there's a couple of questions I want to ask you. Second, what do you know about the health of the !Kung? I find them very interesting since they consume such high quantities of O6. Sorry to bother you. Thanks :-). I still think fructose malabsorption could be part of the problem with sugar. You are absolutely right that sucrose is better absorbed than isolated fructose (unless you're sucrase deficient, which does happen). Basically, fructose is absorbed a lot better if there's glucose around, and since sucrose gets digested to fructose and glucose in most people, that works OK. But there's variability in the ability to absorb fructose, and although it hasn't been demonstrated, I think it's plausible that enough fructose hangs around in some people for long enough to be a problem. It's just a hypothesis at this point. As far as I know, the !Kung are fairly typical of hunter-gatherer populations in terms of health. My interpretation is that their high n-6 intake is balanced by other protective lifestyle factors such as a nutrient-dense unrefined diet, lifelong leanness, exercise, etc. An alternative explanation would be that increased n-6 doesn't have much impact on health. I don't believe that, but it's true that the high n-6 isn't causing them to drop dead. Re: Marilyn Monroe. Clothing sizing numbers were quite different then. Women's sizes started at 10, which was skinnier than skinny (under 30" bust). These days, her bust would not fit in some size 0s and extra-smalls, but if her stated measurements of roughly 36-23-35 and 115-120 lbs at 5'5" were correct, she would indeed fit a size 0 in many brands. At least in bottoms. I'm 32-24-36 and 110 lbs, and many 0s are still too large for me. It depends on the manufacturer. I own clothing labeled from 00 to 10 (higher numbers are from older clothes). I agree with B about Marilyn Monroe. I have the same measurements as MM and I have a few suits and some dresses that are 0's. (Though it's probably more common for me to wear a 2 or 4.) And my vintage clothes go all the way up to a 10 or 12! When you write that a food "does not increase appetite," are you referring to the food's nutrient-properties or to its possible influence on fat regulation (e.g. leptin)? Or is this something different, such as a food's "drug-like" properties (e.g. theobromine in chocolate)? A book published in 1911, "Pure Foods: Their Adulteration, Nutritive Value and Cost" by John C. Olsen, stated "Fats furnish half the total energy consumed by humans in food." This estimate fits well with the USDA estimates of caloric intake from food of 43% in 1970 and 33% in 2008. According to the USDA, total fat consumption was relatively constant between 1970 and 2008, and the decrease in the percentage of calories from fat was due to increased consumption of carbohydrates and protein. These figures suggest a huge increase in carbohydrate intake during the last century and a shift from a high fat diet to a high carbohydrate diet. It has been established that people eat less on a high fat diet. This perhaps explains the difficulty that the ladies had gaining weight. Thank you for that study. I really do think that at least some of the rise in obesity and diabetes (?) (Jenny Ruhl disputes that there is an actual rise in diabetes, though there is a rise in pre-diabetes) is due to exposure to common toxins. Some more dataconflicts, from Taubes article on sugar. "By the early 2000s, according to the U.S.D.A., we had increased our consumption to more than 90 pounds per person per year." "1924, Haven Emerson, director of the institute of public health at Columbia University, reported that diabetes deaths in New York City had increased as much as 15-fold since the Civil War years, and that deaths increased as much as fourfold in some U.S. cities between 1900 and 1920 alone. This coincided, he noted, with an equally significant increase in sugar consumption — almost doubling from 1890 to the early 1920s — with the birth and subsequent growth of the candy and soft-drink industries"
"In the early 1960s, the Japanese were eating as little sugar as Americans were a century earlier, maybe less"
"During the Korean War, pathologists doing autopsies on American soldiers killed in battle noticed that many had significant plaques in their arteries, even those who were still teenagers, while the Koreans killed in battle did not. The atherosclerotic plaques in the Americans were attributed to the fact that they ate high-fat diets and the Koreans ate low-fat. But the Americans were also eating high-sugar diets, while the Koreans, like the Japanese, were not"
The autopsies done in the Korean War and Vietnam on young Americans was an important part of establishing the lipid hypothesis. First time you could see the evidence of arterial streaking in youth. Tootsie rolls? Milk Chocolate? I don't think anyone argues that chocolate, as prepared in the 1940s, was healthy. More importantly, did we suddenly see a huge burst of MIs as those kids arteries aged into today 65 and 70 year olds? As I said before, CVD has improved in the US vis-a-vis the rest of the world, although smoking/standard of care has a lot to do with the numbers. I can still wear comfortably a size 8 skirt that I bought in college the early 80s. Though I'm still the same size, I now wear 4s and have even started buying 2s in some brands. In the storage room of the elementary school where I work is a collection of photos over the years. Staff photos from the 1940s-1960s show women who likely would be wearing size 4s or smaller today. Only a few women appear plump in the photos, and none are supersized. You should check this out. I think you'll like it. Marilyn Monroe weighed around 55kg and was 170cm tall during her 20s. This corresponds to a BMI of 19. Marilyn Monroe was actually very slim by modern standards. She "looked" curvy mainly because she had an exceptionally small waist and large breasts. Most of her female contemporaries were also very thin so she looked much more buxom in comparison. Actually such attitudes towards weight are cyclical. You've got periods where curvy women were considered more appealing and others when the waify look was in vogue. As far as health issues go, women who are chubby or plump (not excessively fat or obese, mind you) are, in general, healthier than their paper-thin counterparts. For some reason, the fat in the body helps to fend off viruses like the cold and the flu.